Digg(.com) is a popular social bookmarking and links sharing website. 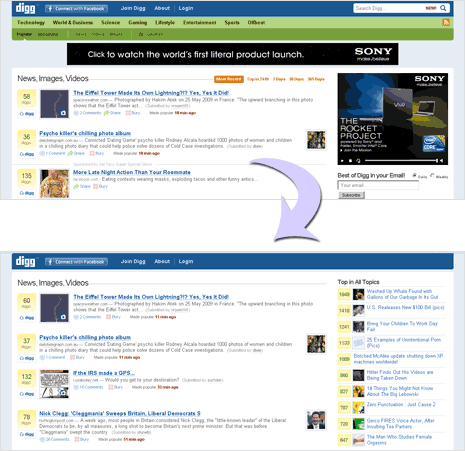 If you love surfing Digg website to explore new websites and content, then switch to minimalistic version of Digg. The minimal version shows you most important content being shared by Digg users minus usual annoyances. 1. Launch your Chrome browser (or download from google.com/chrome). 2. Then install minimal.digg extension for Chrome. 3. After installation, open digg.com website to see clutter free minimalistic version of digg. What is missing in minimilstic digg – no green colored navigational toolbar, no advertisements at all and big Digg footer at the bottom is removed. If you are a fan of minimalistic look, you can also use Google Search and Gmail in simple minimal user interface.